tracks the band through their first decade from 1998 to 2007, telling the ongoing story through rare live videos including the very rare early footage. Featuring many special guest appearances from Mani Neumeier (Guru Guru), Afrirampo, Yoshida Tatsuya (Ruins), Yamazaki Maso (Masonna), Kuriyama Jun (ex Ox), etc. 1-17 : Acid Mothers Temple & The Melting Paraiso U.F.O. includes a historic performance of “La Novia” with Occitan queen of song Rosina de Peira. “Pink Lady Lemonade” medley of many different versions from 1999 to 2007, the 2004 version of “Dark Star Blues”, the 1999 version of “Dark Stars in the Dazzling Sky (a.k.a. Blue Velvet Blues)”, and an exclusive interview with Kawabata Makoto. 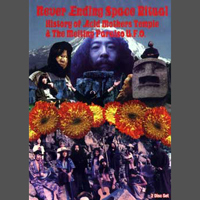 Also live clips of other AMT-related units like Acid Mothers Temple & The Cosmic Inferno, Acid Mothers Temple SWR, Acid Mothers Gong, Acid Mothers Guru Guru, etc. NTSC Region 0. Booklet includes photographs and documentary material. Booklet includes photographs and documentary material.”-from the back cover.